This year the UO Mock Trial program qualified to send two teams to the American Mock Trial Association’s second competition round, the Opening Round Champion Series. All three of UO’s competitive mock trial teams, the A team, Green team and Yellow team, competed at the association's regional tournament against other Northwest collegiate teams, but students in the program were surprised when the Green and Yellow teams qualified for the next round without the A team. “The A team hit some really difficult teams (in competition), so that’s probably why they didn’t make it out, but Green and Yellow totally deserved making it out of regionals,” said Ophelia Cavill, a freshman attorney on the Green team. This is the first time that the program has sent a team other than the A team to champion series, as well as the first time two teams from UO have advanced to regionals. This season’s case for competition centered around age discrimination, with the plaintiff representing a 50-year-old man who claimed that he had been fired from his position at a magazine company by the new CEO, who wanted to make the brand younger and more modern. The teams started working on the case in November to compete at regionals in February. After succeeding in regionals, the mock trials association made some changes to the case to increase the difficulty and make teams rework their approach before the opening round championship. Once the case changes from the first round were published, both the Yellow and Green teams increased their practice time to prepare for the champion series. The Yellow team chose to start from scratch on their defense and went from practicing two days a week to six days a week, three hours a day. The Green team met seven days a week, working hard to build the best dynamic they could with the two new team members that were added in between regionals and ORCS. When the teams travelled to Frenso, California, for the opening round, they faced two days of intense competition. There were two rounds a day, one for the plaintiff and one for the defense, with each trial lasting about three hours. 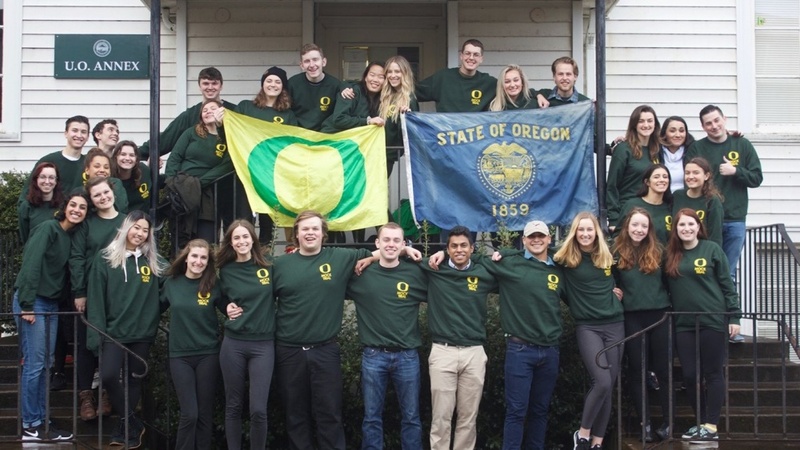 Although the teams didn’t move on to the National Championship Tournament, sending two teams to compete in champion series this year shows that the UO mock trial program is starting to hold a consistent presence in the realm of collegiate mock trial. The program’s focus is now on training its 20 new members, an influx that has nearly doubled its size. In this off season, students are separated into new teams, given a new case and prepare to face off in a scrimmage at the end of the term. The UO forensics department is as old as the university itself and is housed in the Clark Honors College. Although the program is run through the honors college and led by professor Trond Jacobsen, all UO students are welcome to join the program. For more information on the program and how to join visit https://honors.uoregon.edu/forensics.